Lewiston High School Alum, Isaiah Harris, 2014-15 Gatorade Boys Track & Field Player of the Year, stopped 92.7 & 105.5's "The Breakfast Club" Tuesday to talk about his successful freshman year at Penn St, Olympics qualifying, and much, much more. Isaiah Harris experienced highs and lows at the United States Olympic Track and Field trials in Eugene, Oregon, last summer. The Lewiston native advanced to the finals of the 800 meters, and was in second place in the final with 200 meters to go before settling for a sixth-place finish. Harris, a sophomore at Penn State University, has continued to establish himself as one of the top runners at the half-mile distance in the nation, as he is currently ranked second in the 800 among NCAA Division I athletes. Harris ran 1:14.96 to finish 2nd to Casimir Loxsum, 1:14.91. Loxsum and the old world record of 1:14.97. So bittersweet for Harris, breaking what was the world record, only to be beaten. Isaiah Harris of Lewiston ran the second fastest 600 meters in history on Saturday during the Penn State National Open at University Park, Pennsylvania. The Penn State University sophomore eclipsed the previous world record of 1 minute, 15.12 seconds held since 1999 by Nico Motchebon of Germany when he ran a time of 1:14.96. However, the former Lewiston High School star won’t get credit for holding the world record. 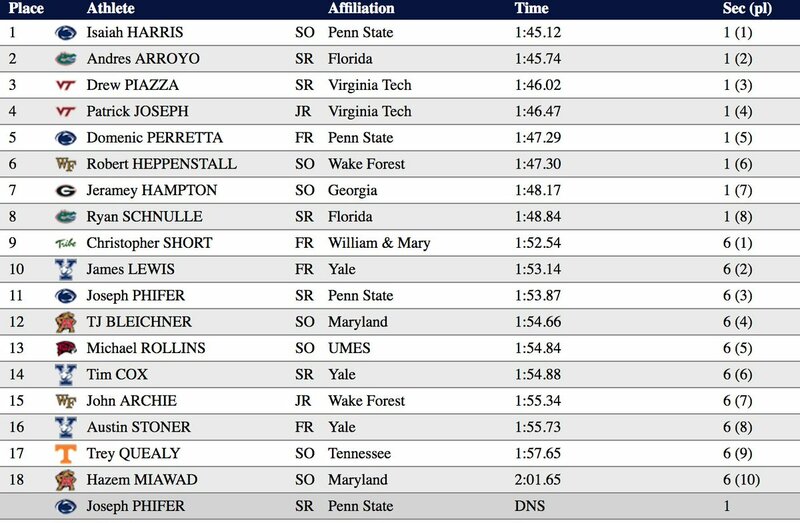 That’s because former Penn State runner Casimir Loxsom of Brooks Running beat Harris by .05 seconds, clocking a 1:14.91 to claim the world record. Lewiston native and Penn State sophomore wins the Big 10 800 championship with a time of 1:47.23 to win by exactly 1 second. He was on the 4th place Distance Medley Relay last night and is scheduled to be on their 4 x 400 relay later today. LHS Alum Isaiah Harris competes for a National Championship this weekend as well - Good luck!!!! Isaiah Harris ran 1:45.64 in the 800 at the Florida Relays yesterday. It is the fastest time in the world this year. ... Harris crossed the finish line in 1:49.68 to defeat Mitch Hechsel, who finished in 1:50.831, and Hechsel's Minnesota teammte, Nate Roese, who was third at 1:50.836. Harris also helped the Nittany Lions' 4x400 relay team score points, running the anchor leg to a second-place finish in 3:05.22. Ohio State (3:04.95) won the event. Purdue (3:05.65) was third.